St. Severus of Antioch, widely known as “crown of the Syrians", is one of the greatest dignitary of the Syrian Orthodox Church of Antioch as well as Malankara Orthodox Syrian Church. Born at Sozopolis in the province of Pisidia (now Sozopolo in Bulgaria) around AD 459. His grandfather (on his father’s side) was one of the bishops who attended the Ecumenical Council of Ephesus (431). His grandfather, whose name was also Severus, saw in a vision someone telling him, "The child who is for your son will strengthen Orthodoxy, and his name will be after your name." When his son had his child, called him Severus. Severus was baptized in the church of Tripoli in 488. At Alexandria, he studied grammar and rhetoric in both Greek and Latin, and jurisprudence and philosophy at the school of Roman jurisprudence in Beirut. Later he chose the way of asceticism and became monk in the Monastery of St. Romanus in the city of Mayoma in Palestine and was ordained a priest by Bishop Epiphanius. Then, he built a monastery and remained there for twenty-four years, worshiping God, practicing the virtues of asceticism, studying the Holy Bible and the writings of theologians. He began to write and support Orthodox doctrine, so his fame spread. Once, the saint was strolling outside the city, a shut-in saint came out of his cave crying, "Welcome to you Severus, teacher of Orthodoxy, and Patriarch of Antioch." Severus marveled at how he called him by his name, for he did not know him before, and how he foretold what would become of him. In 508, he journeyed with two hundred monks to Constantinople to defend the doctrine and remained there about three years until 511. A year and a few more months later, Flavian II, patriarch of Antioch, was deposed, and Severus was elected by the Holy Spirit to succeed him to the Apostolic See. He was consecrated a patriarch in Antioch on November 06th, 512, after which he opened the treasures of his knowledge in preaching and explaining the realities of faith and morals. During his leadership as a patriarch he never deviated from the path of his asceticism and abstinence. So, he removed luxurious living from the patriarchal palace, while devoting his energy to reform and the dispensation of church affairs by visiting the neighboring dioceses and monasteries in person or by letter. When Justin I, the Chalcedonian, succeeded Anastasius in 518, he called upon this Holy Father and gave him great honors to persuade him to change his stand and to follow the Emperor's belief, but the Saint refused. The Emperor became angry, but the Saint did not fear his anger, and so the Emperor ordered him to be killed. Theodora, the Emperor's wife who was Orthodox in faith, knew about what the Emperor intended to do, so she told the saint to flee from his face. So Justin banished a group of Orthodox bishops, antagonizing Severus who left for Egypt on the 25th of September, he was traveling everywhere and visited monasteries disguised as a monk. 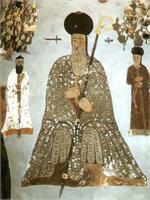 He strengthened the faith of the believers in the Orthodox doctrine. He dwelt in the city of Sakha in the home of a holy lay leader called Doretheos. God performed through him many signs and miracles by his hands, and remained there for twenty-four years. "One day, he went to the desert of Scete, at Wadi-El Natroun, and he entered the church in a uniform of a stranger monk and a great miracle took place at that time. It came to pass, that after the priest had placed the bread (Qourban) on the altar and gone around the church offering the incenses, and after the reading of the Epistles and the Gospel, he lifted off the Ebrospharin (altar covering), and did not find the Qourban in the paten; so, the priest was disturbed and wept. He turned towards the worshipers saying, "O my brethren, I did not find El-Qourban in the paten, and I know not whether this thing has happened because of my sin or because of your sin." The people wept; and straightaway, the angel of the Lord appeared to the priest and told him, "This has happened not because of your sin or because of the sin of the worshipers but because you offered El-Qourban in the presence of the Patriarch. The priest replied, "And where is he, O my Lord?" The angel pointed towards St. Severus. St. Severus was standing in a corner of the church and the priest recognized him by the grace of the Holy Spirit. The priest came to Abba Severus, who commanded him to continue the liturgy after they brought him to the altar with great honor. When the priest had gone up to the altar he found the offering on the paten as before. They all praised God and glorified His Holy Name." In Egypt, Severus administered the church through his deputies or his letters. With indefatigable energy, he wrote book after book against heresies and deceivers, answered letters and gave personal opinions on legal matters. When he faced a difficult problem, he searched for light in the Holy Bible or turned to the resolutions of councils for assistance. In 535, he went to Constantinople in answer to the invitation of Justinian I, in pursuit of unity. At the capital, he won Anthimus, patriarch of Constantinople, to his side, but the gap between the two parties remained wide. Then he returned to Egypt where he died. In 518 upon the vacancy of the See of Antioch because of persecution of St. Severus the patriarch, the Chalcedonians took control of the See and they appointed the following Patriarchs whose line continues in the Byzantine (Rum/Antiochene Orthodox) Patriarchate: Paul the Jew 518-521, Euphrosius 521-528, Ephrem of Amid 528-546. St. Severus, the holy man departed at the city of Sakha on February 8th, 538, at the house of a righteous wealthy man called Dorotheus, where he was hiding. Dorotheus sent the body, in a ship, with trustworthy men to the Zujaj Monastery, located to the west of the city of Alexandria. He commanded them not to enter the bay but to use the lake until they came to the shore. When they came to Kartasa, facing north, they sailed towards the west, but they did not find water deep enough to sail their ship and the crew was saddened and worried. God, the Lover of man, preserved the body of Saint Severus from those who hated him. God made manifest this miracle. He made the ship sail in shallow water for six miles until they arrived to the shore. From there they took the body of the Saint, carried it to the Zujaj Monastery and laid it in the place which Dorotheus had built for it. There was great joy in the city of Alexandria and God worked great signs and wonders through the body of His saint St. Severus. God honored St. Severus after his death even more than during his life. He was crowned by the Church as the Great Doctor of the Universal Church. The Church also commemorates him on the day of his death. His life was written by four eloquent writers who are Zachariah Rhetor, john, abbot of the Monastery of Bar Aphtonya, Athanasius I, patriarch of Antioch, and an anonymous author. Among his homilies, there are one hundred and twenty-five holies called “Homiliae Cathedral’s,” preserved in three large volumes at the Vatican and at the British Museum. Three homilies are in the library of the Zafran monastery and at the library of the church at Homs. Fifty one of these homilies were translated into French and published in three volumes. There are also innumerable letters written by him, estimated at three thousand and eight hundred, a number no other church father is known to have written. These letters were collected in older times in thirty two volumes, of which four were written before his elevation to the patriarchate, then during his patriarchate (512-518) and nine during his exile (518-538). Of these, only two large volumes survived, one of which is entitled The Sixth Book of the Selected Letters of St. Severus of Antioch, translated by the priest Athanasius of Nisbis in 669.A D. Among this, some were translated in to English in the 20th century. All of these letters are splendid and full of abundant theological, legal, historical and administrative information, which reflect the light of that great and noble soul. The works of this great dignitary and his comprehension of the principles and branches of sciences testify that he was not only unique in his generation, but also unequaled among the patriarchs of Antioch who preceded or succeeded him. In the fifth Thubden (Diptych), we remembers this great Patriarch St. Severus as the crown of Syrians, the eloquent mouth, the pillar and the doctor of the Holy Church of God as a whole, the meadow abounding in blossom and who preached all the time that Mary was undoubtedly the God-bearer. The above selected article was taken from Syriac Orthodox Church of Antioch Archdiocese of the Western United States .